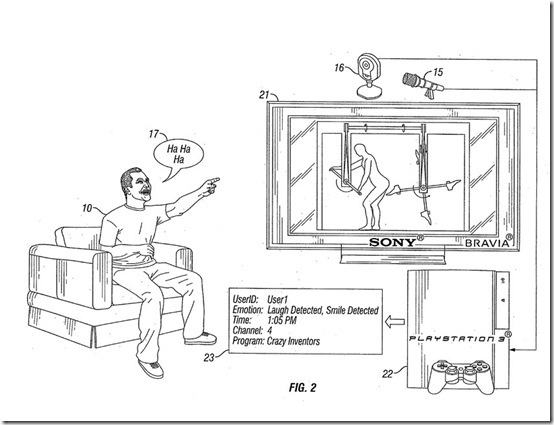 An emotion tracking system has been patented by Sony; it detects laughter and other emotions in media consumers. The application picks up on metadata, which includes laughter recorded by the microphone and a user’s expression from the camera. Both devices are linked to a “game console”, shown as a PlayStation 3 in the diagram, which identifies the user, notes emotions, and transfers the data over a network. The device tracks body gestures and group interactions. Fans of George Orwell are not sure whether to laugh at this version of the telescreen from 1984. It's bad enough that they're watching; I'm supposed to be smiling, too? Or angry; as you may recall, Party members must express their hatred of The Party's enemies.